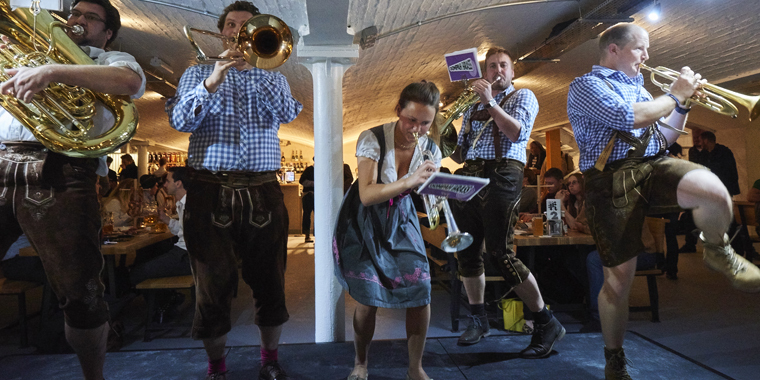 WELCOME TO KATZENJAMMERS, LONDON’S COOLEST BIERKELLER! OUR NEW 200 SEATER BIERHALL. NOW OPEN. Our fabulous new Bierhall opened in October 2015 allowing us to accommodate a further 200 seated guests. Its beautiful barrel vaulted ceilings and industrial design are accented by specially commissioned oak furniture and feature lights rescued from a communist era German power station! As well as a the great new bar serving our full range of biers it also features a fantastic new sausage bar, serving a selection of 10 great imported Bavarian sausages, including the amazing new Katzwurst, made especially for us in München. A great focal point of the Bierhall is the central stage which provides everyone with a great view of our now legendary Oom-Pah bands every week! OOM-PAH, OOM-PAH, STICK IT UP YER JUMPAH! Katzenjammers has become the spiritual home of ‘Oom-Pop’ over the last 6 years. A genius matching of traditional Oom-Pah stylings with pop classics, our bands bring the house down every Thursday, Friday & Saturday creating a hilarious, sing-a-long atmosphere. Not to be missed! IT’S OOM-PAH ON THURSDAYS, FRIDAYS & SATURDAYS!!! Our incredibly skilled chefs provide our diners with sumptuous Bavarian dishes, cooked in true Munich fashion that are perfectly complemented by our real German biers. We also have a selection of wine, champagne and schnapps for the full drinking experience, not to mention delicious desserts! Smoked sausage of finely chopped lean pork and a little salted bacon fat. Pork sausage that has been peppered to give it that extra bite. Bavaria’s favourite sausage! A pale smoked sausage of veal, pork, ginger, nutmeg and other spices. A tasty beef version the bratwurst. Delicious paprika flavoured dense sausage. The Bavarian cousin of Spain’s chorizo. Smoked and spiced with chives and parsley. The big boy version of the frankfurter. Traditional white Vienna style sausage. Our very own pork krakauer and mustard seed wurst created for us by our friends in Bavaria. As with the Katzwurst but a foot long! Tasty beef with a cheeky kick of chilli. For those who appreciate a meat free zone. Any sausage served in a fresh bun with sauerkraut, fried onions and sweet mustard. Any two sausages served with pommes frites and a choice of red cabbage or sauerkraut. Bite size slices of bratwurst served in a curry ketchup sauce – in a bun! Bite size slices of bratwurst served in a curry ketchup sauce with pommes frites and fresh salad. A selection of five sausages served on a bed of sauerkraut or red cabbage. A selection of seven sausages served on a bed of sauerkraut or red cabbage. A selection of ten sausages served on a bed of sauerkraut or red cabbage. Rich chocolate and orange cake. Delicious hunter style almond and custard cake. Our cakes are supplied by the Borough Market’s Backhaus Bakery stall, and are served with a choice of ice cream, whipped cream or custard. If you need to know about our ingredients, please ask staff before ordering. Tables can be booked for the upstairs BIERKELLER & RESTAURANT on Monday through to Saturday anytime except for Friday evenings. Tables can be booked on Friday’s up to 5pm only. Tables can be booked for the downstairs BIERHALL on Thursday and Saturday only. Das ist Gut!. The coolest Bierkeller in London Bridge by far. If you want a taste of Germany this is the place.